Join the discussion on our forums! 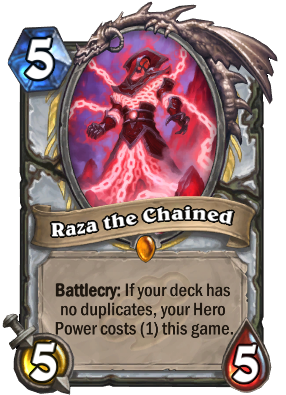 Come discuss Raza the Chained over in our dedicated Raza the Chained discussion topic. Wait raza is getting nerfed?, FINALLY, i can play my midrange hunter again! Rest In Peace old pal . Well, time to craft a golden Raza. Raza the chain was too tight, so he had to get nerfed. I'm a Priest main, and even I'm glad this thing is getting nerfed. You wont be missed, cuck. The Highlander Priest is dead. Good nerf. Still good. So i would say the word: Balanced. I'm looking forward to the time this Card will be DELETED! I used to like this card, but then the retards at Team 5 had to make Shadowreaper Anduin. Surrender your will...to Ben Brode! Guys the easy counter to the deck is to get Spiritsinger Umbra and play two Weasel Tunneler somehow and now they have duplicates in the deck... or you can use The Darkness.